"All we do: we go back to the morgue, we get the body, we go to St. Thomas, we take Bernie to the bank just like before, and we're in like Flint!" Once upon a time (1989) a film called Weekend At Bernie's was released. A low-brow comedy whose gags ran out of steam long before the film ended, it nevertheless grossed over $30 million. Back then, thirty million dollars was certainly a worthwhile impetus for a sequel, and so, in 1993, the world witnessed the release of Weekend At Bernie's II. This much vaunted sequel went on to surpass the original, quickly topping the box office, and was the highest grossing film of all time until a certain sinking ship sent it sailing to number two. Ahh, revisionist history. The real truth is that Weekend At Bernie's II grossed less than $500,000 at the box office. And while I usually don't equate ticket sales with quality, this is one time where the film's gross says a lot about the film itself. Weekend At Bernie's II picks up right where the original Bernie's left off. Larry (Andrew McCarthy) and Richard (Jonathan Silverman) have survived the weekend with no one the wiser. In fact, Larry even gets to keep Bernie's rather expensive personal effects. However, when they show up to work, they're fired, because an internal investigator (Barry Bostwick) thinks they know where the money that Bernie was embezzling from the company is stashed. Meanwhile, a voodoo woman named Mobu (Novella Nelson) sends two New York soul brothers, Charles (Tom Wright) and Henry (Steve James) to New York to reanimate Bernie's corpse. They botch up the job, and Bernie will only dance to music, instead of walking around reanimated all the time. Larry finds a safety deposit box key in Bernie's things, and he thinks that this is where Bernie is keeping his money. Determined to get at the cash, Larry and Richard head to the island of St. Thomas, with Bernie in tow. Unbeknownst to them, the internal investigator is chasing them, and Charles and Henry are looking for Bernie's corpse. Add to this the fact that they don't know that Bernie gets up and dances to music, and you've got a set up for some great comedy. Well, not really. See, the whole "let's hide from the world that Bernie is dead" motif stopped being funny back in the first film. In fact, everything about these characters stopped being funny in the first film. I don't care how much money Weekend At Bernie's made, anyone could see it was a one-time deal. Everyone except for movie executives, that is. I chuckled twice during this film. It was so mediocre I couldn't even laugh at how bad it was. Robert Klane's script is so maddeningly unfunny that audience members might start thinking of completely mundane scenarios in order to find something interesting. Sometimes the dialogue is so bad it's simply embarrassing. The dialogue of Henry and Charles is such a bastardization of what Klane thinks is "authentic" African American slang that I found myself wincing at every word they said. His direction here, unfortunately, isn't any more accomplished than his writing. By far the worst part of Weekend At Bernie's II is Andrew McCarthy. McCarthy's acting here ranges from acting sleazy to acting surprised, and sometimes he's sleazily surprised. Andrew McCarthy (well, and Molly Ringwald) is what gives The Brat Pack a bad name. Not surprisingly Jonathan Silverman coasts through this movie. I always thought Silverman could be very funny when he wanted to be (The Single Guy, anyone? ), but it's obvious that he isn't even trying here. Ironically, the only ones who do seem like they're trying are Tom Wright and Steve James as Charles and Henry. The sole saving grace of the film is Barry Bostwick. Bostwick manages to liven up anything he does, and he's suitably authoritative in his role as the internal investigator. He's the one enjoyable element in a thoroughly unmemorable film. Image Transfer Review: This is a terrible transfer. From the beginning, the whole print looks faded and too grainy. All the bright neon holdovers from the requisite 1980s' color scheme look very pale. Specks and scratches are abundant. This transfer isn't going to win any awards. Audio Transfer Review: This Dolby Digital 2.0 mix is nothing special. The score sounds out of tune in the way that silent movie scores sometimes do, and the dialogue has an audible hiss at times. The sound effects sound louder than they perhaps should be, but they provide an unintentional laugh from time to time. Extras Review: 3 theatrical trailers are all that's included, for Groundhog Day, Cops and Robbersons, and Weekend At Bernie's II. 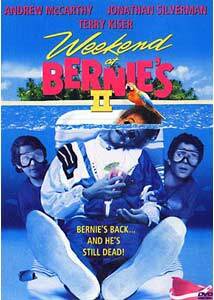 According to the tagline, "Bernie's back�and he's still dead!" Perhaps it should have said, "Bernie's back�and he's still dead�and you'll wish this movie would have to!"